"I did receive Scoobys angel recently. It is beautiful. Thanks so much for doing what you do. Everything arrived safely. 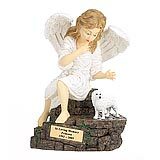 I miss Scooby very much, but its nice to know there are options like this to memorialize such a wonderful animal and relationship." 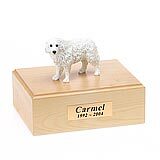 All available Great Pyrenees dog urns and memorials will be displayed with the figurine on the Great Pyrenees urn you select and in the appropriate size.